Joseph Mallord William Turner (Covent Garden, London, 23 April 1775 – Chelsea, London, 19 December 1851) was an English painter and artist. He was one of the greatest artists of landscape painting, with a great mastery of light and colour. His father was a maker of wigs. 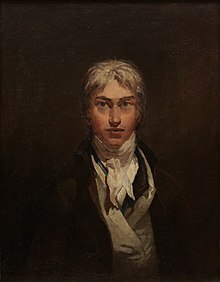 His mother was ill with mental problems, and the young Turner was sent to live with his uncle in Brentford, where he first started to paint. Turner became a student at the Royal Academy of Art school in London when he was 14 years old. He was accepted into the Academy a year later. He had a watercolour painting in 1790 in the Academy's important art show. He had only been studying for a year. In 1802, at the age of only 28, he was elected a member of the Royal Academy, and later became its Professor of Perspective. In 1802, Turner travelled around Europe, visiting France and Switzerland. He also went to the Louvre in Paris. During his life, he often travelled across Europe, visiting Venice in Italy several times. As his personal style developed, he began to produce paintings that were generalised or exaggerated in form and colour, rather than realistic or detailed. These caused much argument as to their artistic value, but nowadays are his best loved works. On his death, he left 300 oils and 20,000 watercolours to the British nation. Some of his watercolours are the most abstract or generalised of his paintings. Turner never married, although he had two children with his mistress Sarah Danby. For much of his life, he lived with his father, who helped him in his studio until he died in 1829. In his early career, Turner was influenced by the painters Claude Lorrain and Nicolas Poussin, who painted "historical" landscapes. 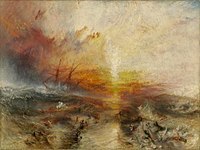 Turner became interested in natural catastrophes, and natural phenomena such as sunlight, storm, rain, and fog. He was fascinated by the violent power of the sea. His paintings revolve around the light of the sun, shown in infinite variety. His work showed some of the ideas of the impressionists decades before they arrived on the scene. Monet, in particular, studied Turner's methods. His most famous paintings include The Fighting Temeraire tugged to her last berth to be broken up. Often called just The Fighting Temeraire, this is a picture of a famous warship that was used in the Battle of Trafalgar. Other pictures include Rain, Steam and Speed, which shows a steam train crossing a bridge, and Snowstorm which shows a steamship in a snowstorm trying to get into a harbour. In order to get the right feeling into this painting, he had himself tied to a ship's mast during a storm, so that he could see what it was like. Some of his most famous paintings show the roughness of nature, with bleak landscapes and violent storms. But also there is beauty and a sense of calmness in pictures such as Crossing the Brook, a stunning scenic view of the Tamar Valley and River from New Bridge near Gunnislake in Cornwall, painted in 1815, a view which can still be admired today. As he grew older, Turner's behaviour became a bit odd, and he became depressed quite often. He died in Chelsea on 19 September 1851, and was buried next to the painter Joshua Reynolds in St Paul's Cathedral. Even while Turner was alive, some people thought he was a genius. Some people complained that the pictures he painted when he was older were not realistic, and some even joked that they could have been painted with a mop. However, most think that his way of painting shows complete mastery. The shipwreck of the HMS Minotaur, oil on canvas, completed in 1810. ↑ Bailey, Anthony 1997. Standing in the Sun: a life of J.M.W.Turner. Sinclair Stevenson, London; HarperCollins, New York. This page was last changed on 30 April 2016, at 19:26.